There’s no questioning Google’s dominance in the digital advertising world. Google is the most popular search engine on the globe, which means that they have access to millions of users at any given time. It’s no wonder that in 2018, almost every business has either heard of Adwords or is actively using the Pay-Per-Click platform. Google’s Adwords and Adwords Express programs work within the search engine to bid on keywords so ads can display to users searching with specific keywords, or variations of those keywords. There are also Ad Extensions which allow for Click to Call functionalities, pricing information, ads showing in the maps section, and more. If you then include their vast Google Display Network (which allows for ads to display on a network of various websites) you can potentially follow, or re-market to, users that didn’t convert on your site throughout their internet navigation experience. 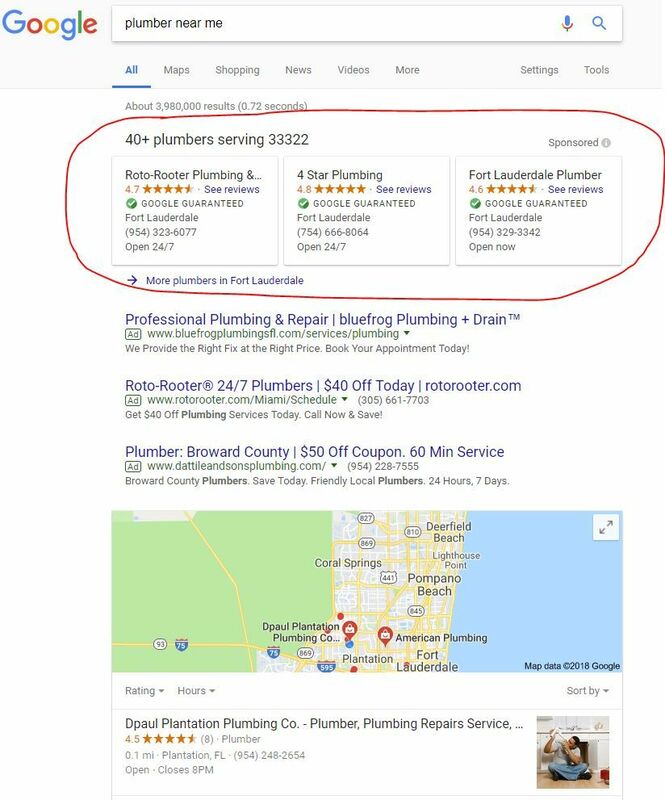 Most recently, Google has slowly rolled out their Google Guaranteed program, or Google Local Service Ads.These Ads are meant to display above the normal Paid Ads, making top placement accessible to those willing to bid a set amount per “lead”. Unlike Adwords, the Google Guaranteed program only charges advertisers for the lead and allows end users (your customers) the opportunity to have Google “guarantee” the service experience. There are also requirements to even be considered for the Google Local Services ads, including a background check for the service provider and the need for positive reviews on the advertiser’s “Google My Business” listing page. At OMG National, we’re closely monitoring this initiative. Since the beginning, back when it was called Google Home Services, we’ve followed the updates in an effort to better understand what’s needed to qualify for the Google Guaranteed badge. We know that Google puts the highest emphasis on the user experience, putting their loyalty and trust above that of the advertiser. They will sacrifice the revenue from a low quality ad, rather than displaying ads which they deem misleading, not relevant, or which link to web pages which are not sufficiently descriptive, slow loading, or which do not meet other criteria. This understanding helps our clients gain an edge over the competition, saving the time, aggravation, and frustration which many associate with using Google’s Adwords platform. What does the Google Guaranteed badge mean? What does it mean to be Google Guaranteed? It means that your business has a claimed and verified Google My Business listing, you’ve provided the required licensing information for your profession, shown proof of liability insurance, and submitted background data on any employee who will be working directly with the public. Google has contracted with the famed Pinkerton Detective Agency for these background checks. There’s also a rating/review factor involved with attaining the Google Guaranteed badge. Though their terms of service do not specifically mention what the criteria for ratings are, our research has shown no “Google Guarantee” ads where the company has less than a three star rating on their Google My Business page. Once confirmed, you will be shown a fixed cost per lead, once that lead is converted, you’ll be able to request a review from that customer from your Local Service ads platform. Google is also promising to back the work with up to $2000 in reimbursement should your customer be dissatisfied and unable to resolve any issues with the service provider directly. Advertisers are provided with access to the platform via a smartphone app or desktop dashboard. You’ll be able to view a record of leads, follow up with leads, and more. Google Local Service phone call leads will come through a Google forwarding number directly to the main business line. You’ll hear the message: “Call from Google” so you know where the call is generated from. Message leads will come through the Local Service app and an email notification will be sent with a link to your Local Service inbox. It’s very important to respond quickly, a consistently fast response time for messages could improve your ad ranking increasing your ability to receive leads. The Google Guaranteed program is just the latest advancement in paid search, Google’s attempt at inserting themselves into Angie’s List and Home Advisor territory. They are cutting out the middleman and providing users with verified, Google recommended results. Studying the digital landscape for years has proven that embracing change early, especially with Google, can enhance the results of your digital marketing campaign.